Today, I want to share with you some words of love and advice. We hear about self-love/self-care so many times. And, at times it might sound like selfishness or arrogant. But the truth is, self-love is so essential. It is described as love of self; the desire to promote one’s own well being. It is about working on our personal developement, being honest with ourselves, focusing on the positive, forgiving ouselves. Also, it’s about being grateful, doing things and hobbies we love and caring for our body. Why is self-care important? Because it gives a feeling of accomplishment, it benefits us in so many ways and it is an ultimate key to happiness. This weekend, I invite you to take some “me” time and indulge yourself into something that just the thought of it is making you smile right now. 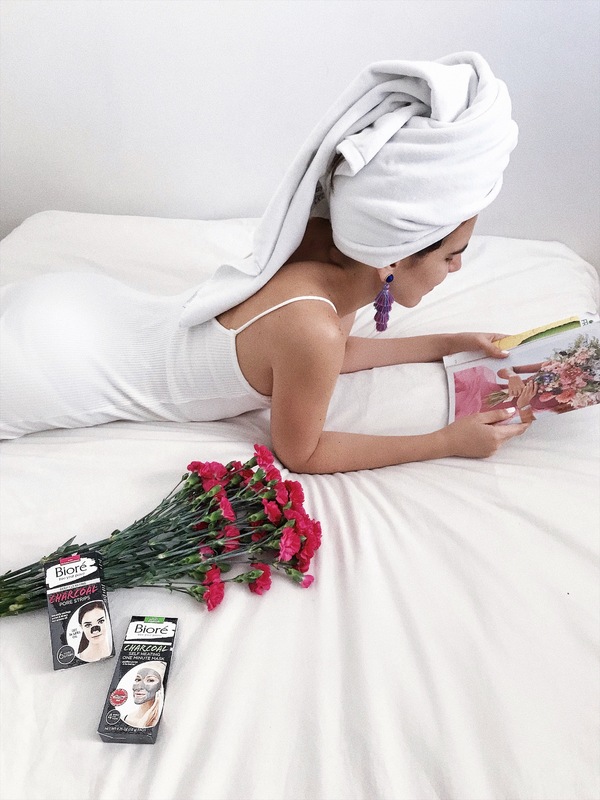 It can be reading that novel you’re always thinking of, watching that romantic film, taking yourself to dinner, buying the most beautiful flowers for yourself. Whatever it is make sure this weekend you pamper yourself with self-love like never before, doing things for you that tells you that YOU love YOU! Here I’m loving this little “me” time taking care of my skin. Since I have oily skin, when I travel, I always carry with me some products from Bioré because their products are great at cleaning pores. The unique ingredientes in their products target the root of all skin problems, clogges pore. This award-winning mask is best known for its ability to draw out impurities to leave the skin smooth and refresh. It is infused with natural charcoal. It heats up, never hardens, and rinses clean. I am making time in my schedule to apply it at least 2-3 times a week to get my skin look its best, yay! I mean it melts aways dirt and oil in just 60 seconds. Aww and it actually feels so good, I never want to take it off. It leaves a cooling sensation for tingly tight-oh-so-smooth skin. You got to try it for yourself, it is totally worth it! 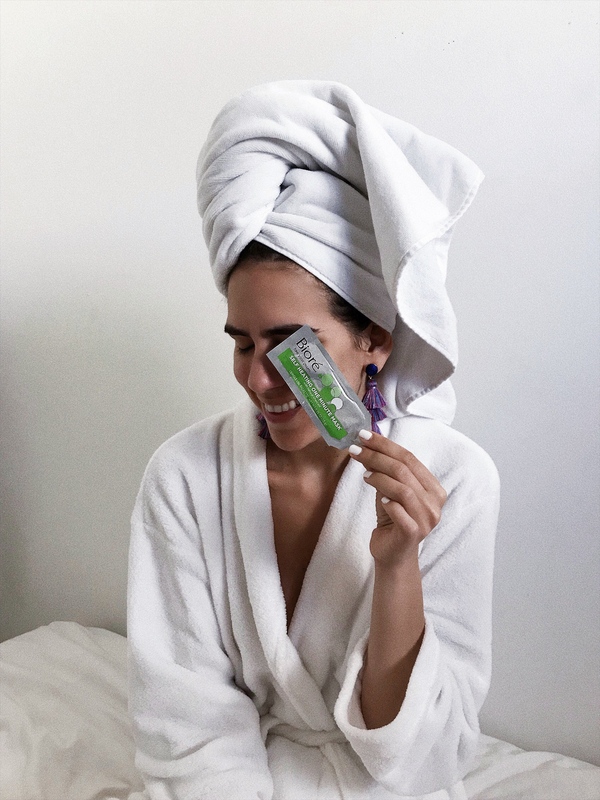 I love using these strips because they are trusted way to purify pores and are infused with natural charcoal. In just one strip, it unclogs pores by removing excess oil in just 10 minutes. And, if used regularly, they actually diminish the appearance of pores. So, I will for sure start stripping weekly to help my complexion look better. While stripping, I can read articles about judaism that I love while listening to songs from my french cooking playlist. Ahhh! It’s so satisfying!!! I truly hope I got you inspired, and I’ll love if you share below what you’ll be doing for you this weekend! Looks like you had a great pamper! Have a lovely weekend. 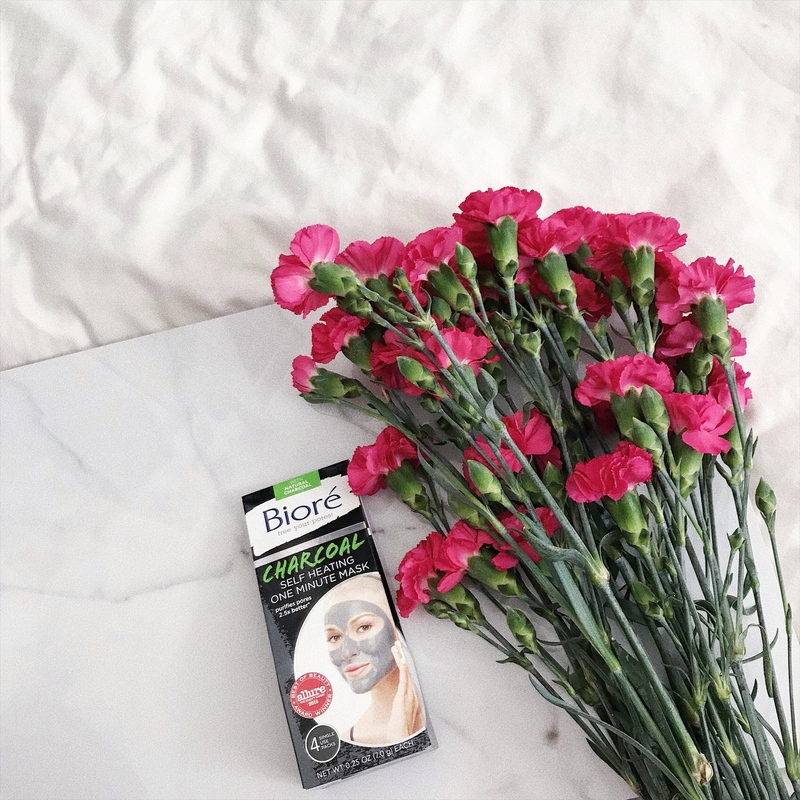 Biore is seriously one of my favourites! I love how accessible it is. Their new acne products are my life! I need to try these products too. I saw them just yesterday and considered whther I should take them. I love some “me” time!! It’s so necessary! I love using ALL of their products! So good!! I love having my “me time” everyday through my skincare! Things like a face mask or a face massage take it to the next level. The face mask sounds really good!!! Biore strips are great. I love to go for a massage every couple of weeks as a treat to relax and unwind. I tried the patches and also a cleansing gel! They are great products! Thanks for sharing! This is amazing babe! thanks for sharing! I agree with you about self love because no one will love you better than yourself. Your skin looks so perfect, I didn’t know it was oily! This has been getting pretty good reviews, will definitely have to give it a try! 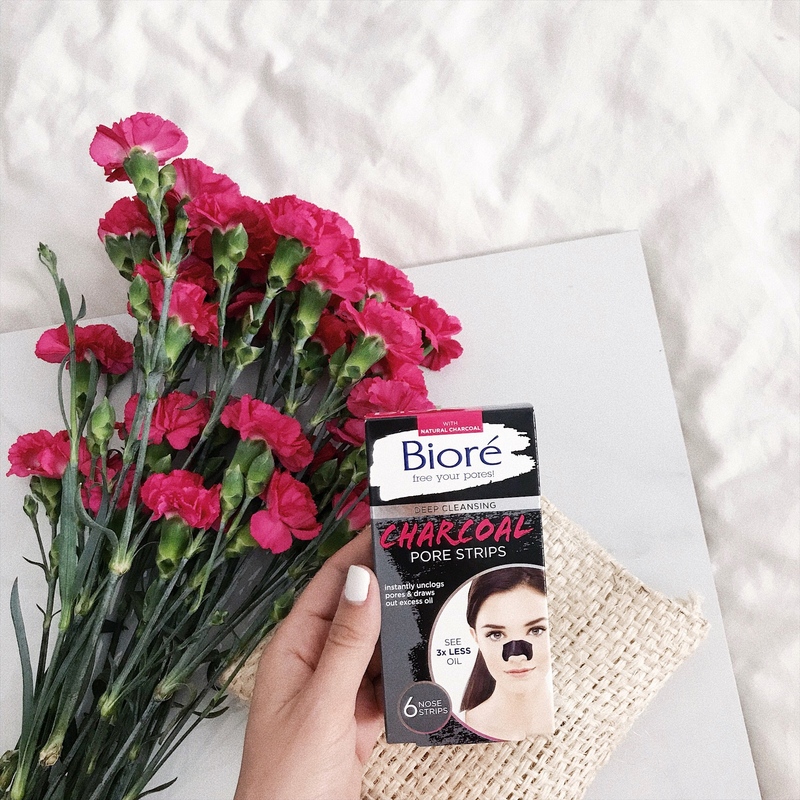 Biore is such a wonderful brand, there are so many products I’m loving at the moment, especially their baking soda range. I definitely need to try that self heating mask. I’ve always wanted to try Biore pore strips, they actually look really nice! 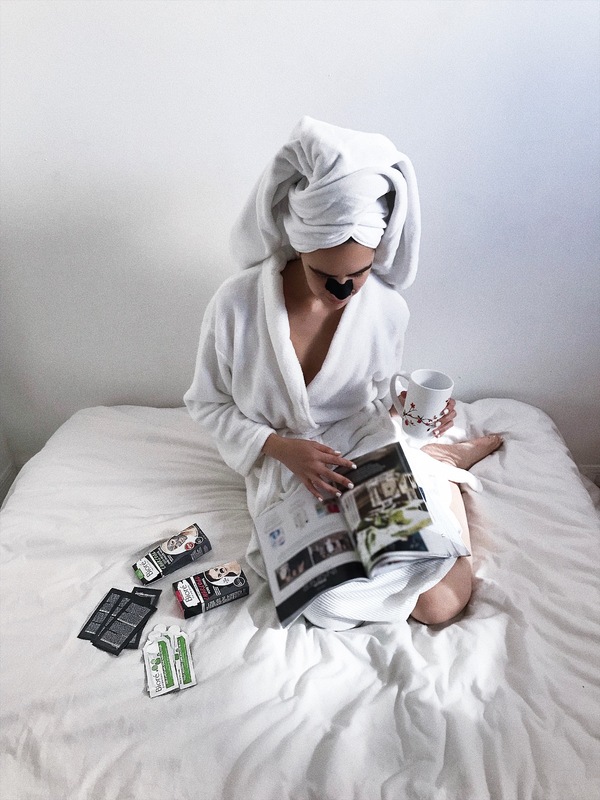 I agree, self care is so important – I have me-time every week if I can haha! I’ve been meaning to try these, thanks for the reminder! Also love a little bit of me time, hehe. Need to give these pore stripes a shot! Thanks for sharing. I love this post! Self love is the most important!! And I use those Biore nose strips- they’re awesome!! Great post and beautiful photos! Love this brand! I’ve heard such great things about their skincare products and how they’re great at shrinking pores. Thanks for sharing, babe, and I hope you’re having a great start to your week so far! I couldn’t agree more! Me-time is so important! For me, it’s a way to clear my mind, to be ‘myself’ again! And did you just say charcoal? Charcoal skincare products are popping up everywhere! Would love to try this facial mask! I love Biore! Great post thanks for sharing! I really want to try out a charcoal mask – been seeing them everywhere!